Week 28 – Stop settling for crumbs. These are some of the messages woven into my book, The Art of Extreme Self Care. This past week, I had an experience related to these messages that touched me deeply. After a long drive, I arrived thirty minutes early for a medical appointment on Thursday afternoon. I pulled into the lot, parked my car, and closed my eyes to rest before going in. 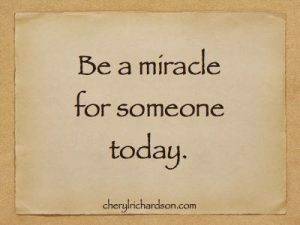 A few minutes later, I opened them to see a beautiful young woman standing outside the front door with a baby in her arms and a small child sitting in a carriage at her feet. I watched for a while as she gently rocked the tiny boy on her hip while occasionally smiling at her daughter. I closed my eyes again and when I opened them fifteen minutes later, I noticed the mother still standing by the door looking a bit anxious. I wondered: Is she waiting for someone? Has she been standing there long? Are her children okay? I decided to go over to check on her. Smiling, I approached and asked if everything was okay. In a quiet, rather shy voice she explained that she lived almost an hour away and that she was waiting for a ride home from a public assistance car service. A doctor in the building had seen her daughter who wasn’t well and they had finished their appointment two hours earlier. The car hadn’t shown up yet and, each time she called to see where it was, she was told it would be any minute. She was told to stand outside so the driver could see her. I immediately took out my phone and asked for the car service number. Then, getting a supervisor on the line, I inquired about where the driver was and as graciously as I could, explained that it was unacceptable to leave a mother with two small children standing outside of a building for so long. It was clear from the supervisor’s attitude that this young mother hadn’t been a priority. I attempted to get his support but eventually gave up and started calling around for another car service. Just then, the driver pulled up. I saw myself, years ago – a woman committed to keeping the peace at any cost, a young girl in an adult body desperately trying to get her needs met without making any trouble. I never rocked the boat, wouldn’t raise my voice, and rarely asked for what I wanted. Instead, I settled for crumbs when everything inside me screamed for a whole meal. My reaction to this young mother’s situation reaffirmed the deeper reasons why I feel so committed to teaching the principles of Extreme Self Care. When we learn to speak up for ourselves, we feel compelled to speak up for others who haven’t yet found their voice. When we stop tolerating bad behavior, we have a hard time allowing that same bad behavior to happen to others. And when we accept a higher standard of living, we naturally want that same standard for others, too. Most important, as we become more mature, conscious human beings, we begin to understand that we’re all connected and that we have a responsibility to care for one another. I hope the young woman learned something from my actions that day. And I hope her example reminds you that you deserve to be treated with care and respect, too. Yes, speak up, I say – graciously and loudly. This week’s video shows the sweet side of humanity. You can watch it here.